The roads in Macon County will have a little more traffic beginning Monday, August 28 as students across the county head back to school for the new year. With more than 50 buses throughout the district and hundreds of parents driving their children to and from school, motorists should allow for some extra drive time in the mornings and after 3 p.m. while everyone gets into the new routine of the school year. The National Highway Traffic Safety Administration considers school buses to be the safest form of transportation for daily school commutes. However, each year, nationwide, numerous students are injured getting on or off the school bus. Most of those fatally injured are children, 5 to 7 years old. Accidents involving school buses most commonly happen when students are getting on and off the bus. The “danger zone” which is the 10 feet in front, behind or on each side of the school bus, makes it difficult for other motorists as well as the bus driver to see a child. Students often assume the bus driver can see them when they are in the danger zone, but that assumption has often proved fatal, according to the National Highway Traffic Safety Administration. • Walk with your kids to the bus stop and wait with them until it arrives. Tell kids to stand at least three giant steps back from the curb as the bus approaches and board the bus one at a time. • Teach kids to wait for the bus to come to a complete stop before getting off and never to walk behind the bus. • If your child needs to cross the street after exiting the bus, he or she should take five giant steps in front of the bus, make eye contact with the bus driver and cross when the driver indicates it’s safe. Teach kids to look left, right and left again before crossing the street. • Instruct younger kids to use handrails when boarding or exiting the bus. Be careful of straps or drawstrings that could get caught in the door. If your children drop something, they should tell the bus driver and make sure the bus driver is able to see them before they pick it up. • Drivers should always follow the speed limit and slow down in school zones and near bus stops. Remember to stay alert and look for kids who may be trying to get to or from the school bus. • Slow down and stop if you’re driving near a school bus that is flashing yellow or red lights. This means the bus is either preparing to stop (yellow) or already stopped (red), and children are getting on or off. Every day during the school year, 3,100 cars pass stopped school buses in North Carolina. Since 1999, there have been 13 kids killed due to drivers failing to stop. In July, Gov. Roy Cooper signed the “School Bus Cameras and Civil Penalties Bill,” or Senate Bill 55, into law. The law is intended to help cut down the number of times people pass a school bus. 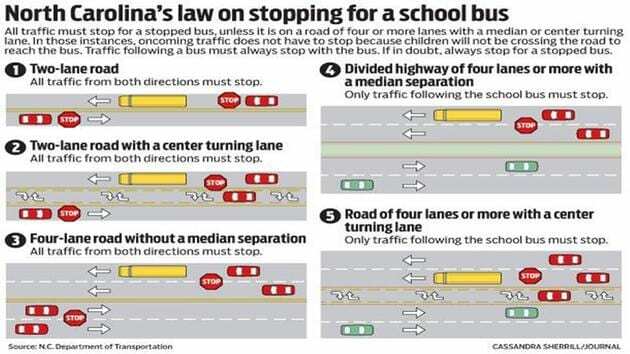 While it’s already state law for drivers to stop in both directions when a school bus is stopped, local governments and school districts will be given the option, m and ideally additional funds to install additional cameras on school buses. The system will work much like red light cameras. When the stop arm of a school bus comes out and flashing lights turn on, so will the camera. Macon County buses are outfitted with cameras and tracking systems. Breaking the current law is a misdemeanor, but if a driver strikes a person while driving past a stopped bus with its stop arm out and lights flashing, it’s considered a felony in North Carolina. Civil penalties will be added on top of the charge, whether it’s a misdemeanor or felony. The fines collected from the driver will directly benefit the county in which the crime was committed. That money will go directly back into safety equipment for that county’s buses.